The Health & Safety Code requires that needle exchanges be part of a greater network of treatment for drug addicts. In our monthly reports, we have noted that the County consistently fails to adequately bring SSP clients into treatment (1%), and fails to offer them drug education (4%). As noted above, the HSA intends to refer more clients to mental health and substance abuse services. Furthermore, the HSA is to seek additional available funding to “enhance the SSP as a substance use disorder intervention program to support SSP clients in recovery” and to participate in statewide and local initiatives to address the opioid epidemic. 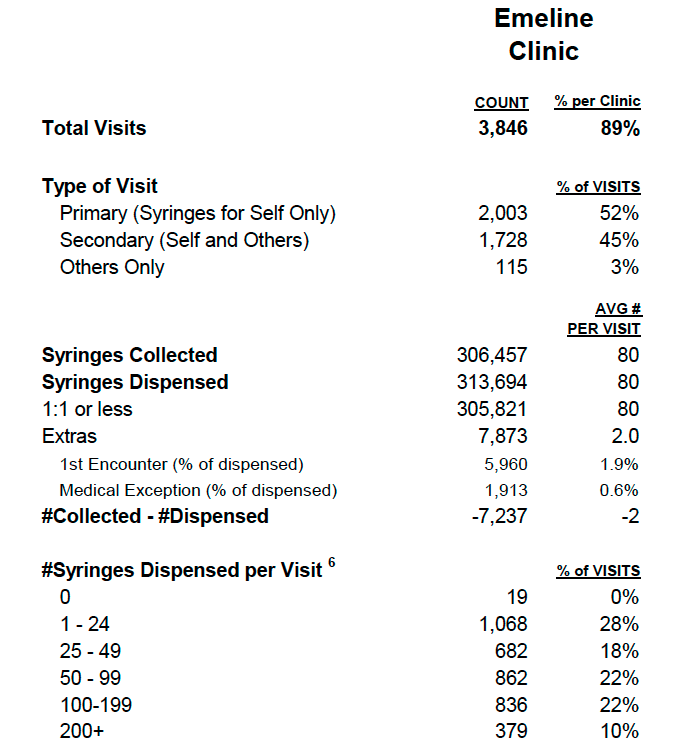 The HSA continues to convert its kiosk weights into “number of syringes collected” in an effort to inflate its numbers. The HSA does not address ongoing concerns about how needles are actually “counted” for exchange purposes. Pick Up of Discarded Needles: City of Santa Cruz Department of Public Works workers, as well as Santa Cruz Police Department officers, continue to pick up hundreds of needles around Santa Cruz every month, while County workers pick up less than ten. The County should be provide more resources to needle pick-up, rather than leaving that burden to the City. Establishment of Fund for Needle Stick Injury Victims: At least one family was financially devastated by a needle stick injury. While the family had insurance, it did not cover the anti-HIV medication, which costs approximately $1,500 per month. Since County Health is seeking to prevent the spread of disease, it should provide treatment for members of the public who are injured by discarded syringes. Negative Impact of SSP on Surrounding Neighborhood & The Community: Missing from the County’s 2017 Biennial Report on the Syringe Services Program is any mention of the negative impacts to the surrounding neighborhood from the program, and efforts, if any, by the County to combat those impacts. We encourage Emeline neighbors to email the Board of Supervisors and County Health. Or better yet, come to the Board of Supervisors meeting on June 6, 2017 at 1:30pm to speak in person. Needle Exchange or Needle Supply? Where are all the needles coming from? Concerned About “Syringe Services Program” Impacts on the Community?